Construction of the new U.S. Bank Stadium in downtown Minneapolis is substantially complete and ready for business. Finished six weeks ahead of schedule, the new stadium and home of the Minnesota Vikings features a bold, iconic design. Contractor Mortenson Construction symbolically turned over the stadium’s keys to the Minnesota Sports Facilities Authority (MSFA), the building’s owner, and the Minnesota Vikings during the MSFA’s June board meeting. The architectural landmark is 1.75 million square-feet and cost $1.1 billion to build. With seating for up to 70,000, the stadium features a fixed-roof design with the largest span of transparent ETFE material in the country; five large glass pivoting doors; zinc metal exterior panels; the closest seats to the field in the NFL; seven levels connected by stairs, ramps, escalators and elevators; the first NFL stadium built with LED lighting; increased and enhanced concessions; 2,000 HD flat screen TVs; and two concourses with 360-degree circulation and various views into the bowl. 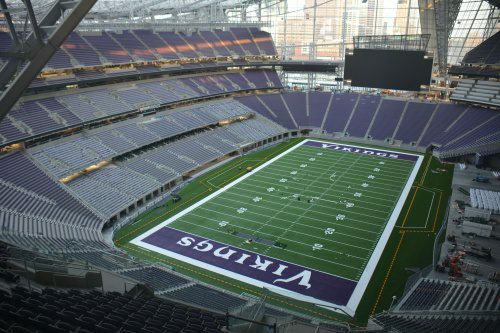 A photo of U.S. Bank Stadium shows the inside of the arena, which will host the Minnesota Vikings NFL football team and Super Bowl LII. 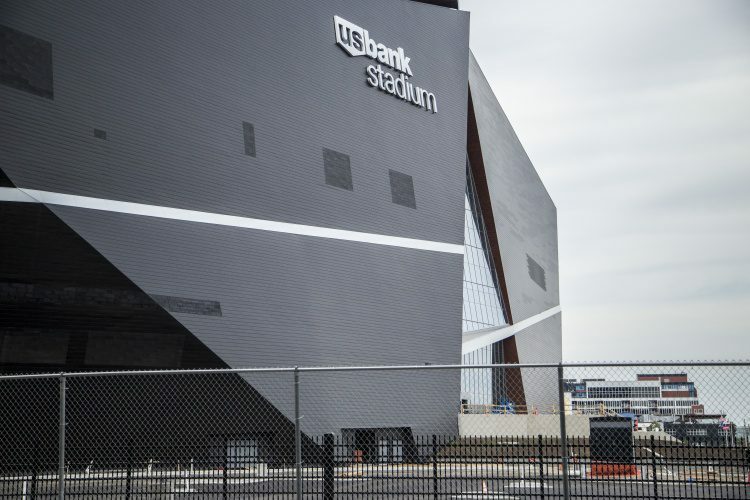 The construction of U.S. Bank Stadium set a new standard for sports facilities. Followed by a groundbreaking ceremony on Dec. 3, 2013, the stadium was built in two-and-a-half years, several months shorter than originally projected, and for less than other similarly sized sports facilities. 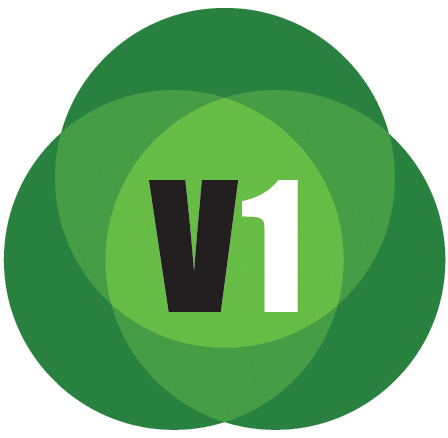 The project also achieved unparalleled workforce participation and local-business involvement that far exceeded the established goals for the project. More than 8,000 workers committed more than 4 million hours on the project to date. 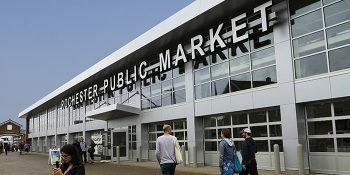 The City of Minneapolis issued the building’s certificate of occupancy a month-and-a-half early on June 3. The constrained downtown location afforded little room for stormwater storage, so engineers elected to go underground with the retention system. The first sporting event at U.S. Bank Stadium will be AC Milan v. Chelsea F.C. on Aug. 3 as part of the 2016 International Champions Cup. The Minnesota Vikings 2016 home opener is Sept. 18 vs. the Green Bay Packers. U.S. Bank Stadium also will host Super Bowl LII in 2018 and the 2019 NCAA Men’s Final Four. The downtown location of the stadium left a limited footprint for a stormwater storage system. 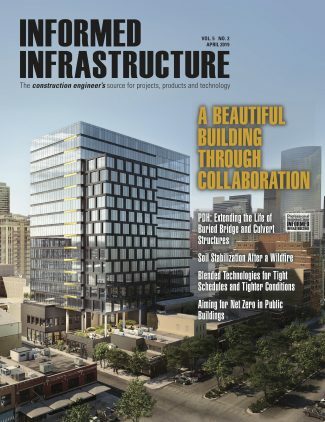 Engineers chose to store the stormwater in an underground retention system that provides the required storage in a limited and constrained footprint. 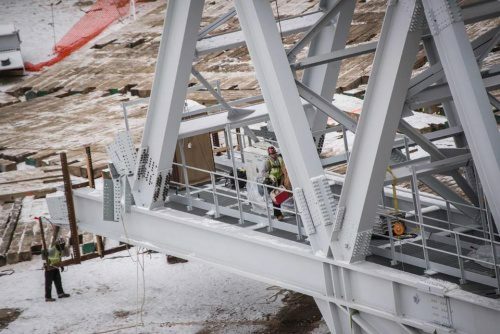 This steel Ridge Truss was the largest structural steel component on the project, weighing more than 700,000 pounds. The piece, which has a depth of 36 feet at its tallest dimension, is 16 feet wide and 197 feet long, with a catwalk pre-assembled within the truss. The retention system is made from 1,000 feet of 144-inch-diameter perforated Aluminized Type 2 Corrugated Metal Pipe. The system not only stores the water, it releases it slowly over time into the surrounding soil via the perforations in the pipe. 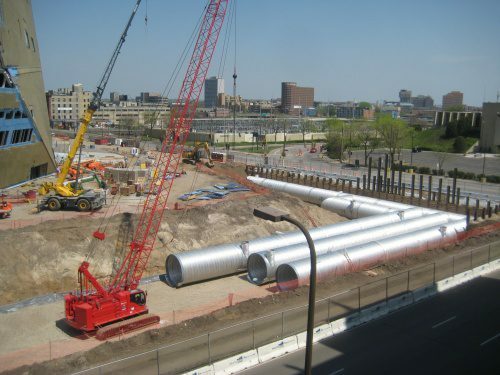 This reduces the amount of runoff leaving the site, recharges the groundwater supply, and eliminates the need to pipe the water into the city’s sewer system. Thornton Tomasetti’s structural engineering and other teams collaborated with HKS architects to design an innovative building that features a series of operable panels in a glass end-wall that pivot to provide natural ventilation and access to the west plaza. The design team utilized Thornton Tomasetti’s parametric modeling techniques to perform slope optimization studies that have created one of the lightest structural steel stadium roofs in North America. The steeply lofted steel roof, a principal architectural feature, is designed to shed the Minnesota snow. A single monumental steel ridge truss spanning 970 feet along the length of the field provides the primary support for the roof structure. At 240,000-square-feet, the transparent roof will be the largest ETFE roof in the United States. The transparency will afford panoramic views of the outdoors, allow natural light to infuse the interior of the stadium, and produce additional solar gain to warm the stadium.